After a relaxing Spa treatment at L’Auberge Del Mar and walk along the beach, we decided to dine at the fine dining restaurant KITCHEN 1540 inside the L’Auberge Hotel and Spa in Del Mar. Guests were sitting outside on the lovely patio inhaling the ocean air and inside private cabanas for intimate dining. Also on the patio is a vertical, hydroponic garden growing beautiful succulents. With a slight chill in the air, we chose a corner table inside next to a yellow tiled fireplace and glanced at the new Executive Chef Brandon Fortune’s menu. Many of his dishes looked enticing. Starting off with a glass of Prosecco, we learned that Chef Brandon works with Chef de Cuisine Jeff Hubbard in preparing a whimsical approach to Modern American cooking. With Chef Brandon at the helm, the menu will continue to change a little within the next month to incorporate a new evolution of beach cuisine. While enjoying our appetizers of an interesting cuttlefish seafood plate and a Kale Caesar salad with smoked yolk, brioche croutons and Parmesan cheese, Chef Brandon came out to our table to greet us. When I asked him when did he decide to be a chef, he responded that he wanted to be a baseball player as a kid. He enjoyed cooking and preparing meals for tailgate parties. However, instead of sitting in a dugout, he graduated from the Le Cordon Bleu College of Culinary Arts in Atlanta. Afterwards, he came out to California to open the fine dining restaurant at the nearby Grand Del Mar. 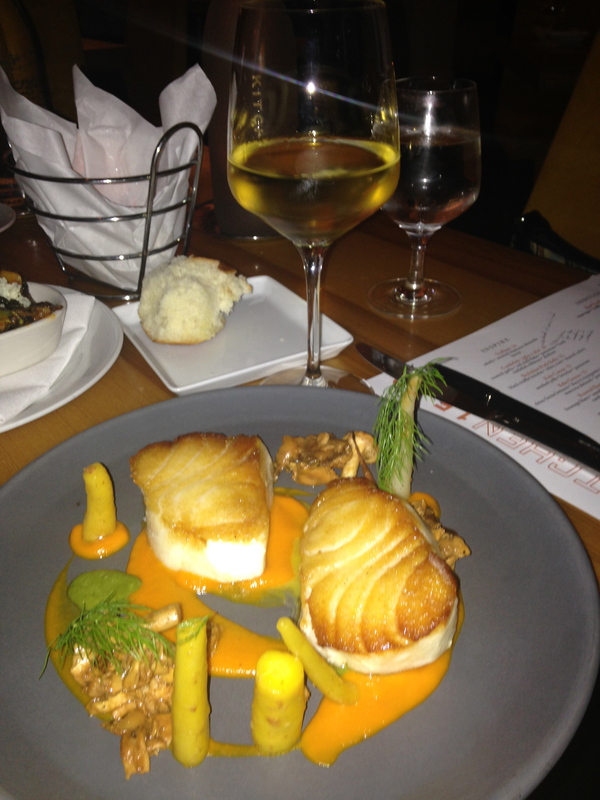 The Chilean Sea bass was marvelous. We remarked that his cuttlefish appetizer was so unique. 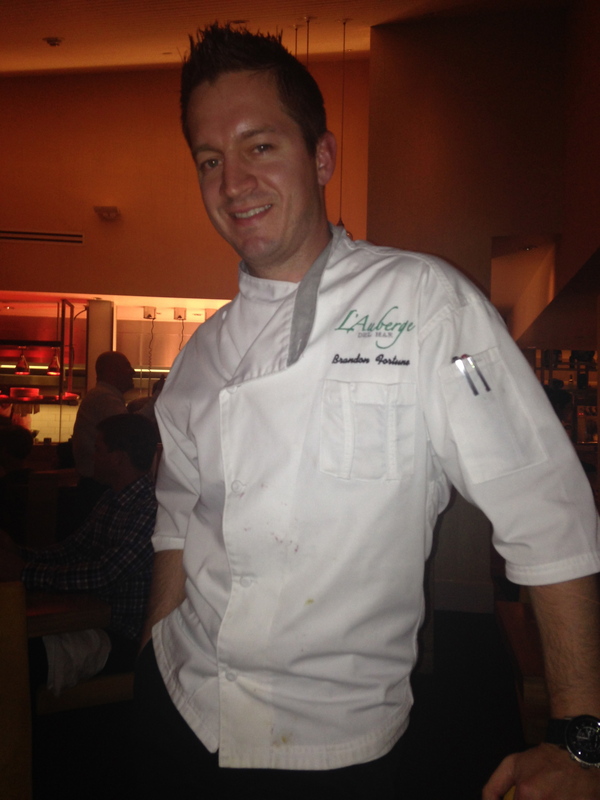 Chef Brandon told us it is a labor intensive dish that resembles pasta and is ideal for gluten-free diners. It is sauteed in garlic olive oil and parmesan with basil. The cuttlefish ribbons are adorned with abalone and sea urchin. Chef Brandon shared that he is going to incorporate some new dishes into the menu that may include Shrimp and Grits served in and elevated classic way. He will smoke his own ham and prepare some Cajun dishes by the time summer rolls around. “The menu will have some simple, less progressive and more French dishes that are less molecular and more soulful,” said Chef Brandon. I really enjoyed his fried Brussels Sprouts have a flash of fire with chili, bacon and crumbled blue cheese. It’s one of the most spectacular Brussels sprout dishes, hands down. For entrees there is a nice offering of fresh fish. I ordered the Chilean Sea Bass that arrived with two pieces of fish, on a smear of carrot coriander with a dash of nutmeg and clove. There were al dente carrot tops on little dabs of green pesto. My husband ordered the Black Cod with roasted clams in their shells, potato confit, black French mussels, fennel and arugula. 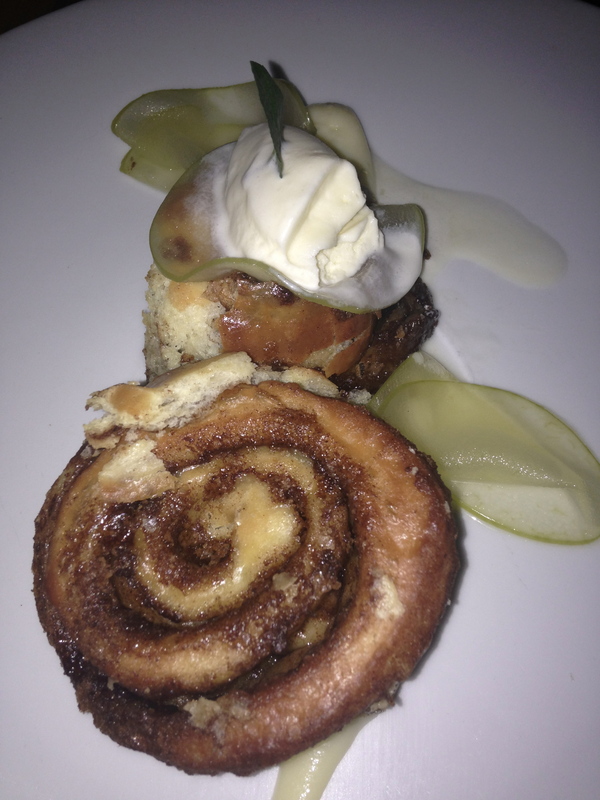 Pastry chef Derek Fledman makes a terrific housemade cinnamon bun with bay leaf ice cream. A sweet ending to a wonderful meal. Walking out of the restaurant we noticed the lobby was filled with locals enjoying the live music and socializing. It’s a popular gathering spot on Thursday through Saturday evenings. We sat at a comfortable bench and listened to the music while people watching. Staying overnight at the resort, we strolled back in our room and opened the window to hear the sound of the waves, while enjoying the fresh salty air. 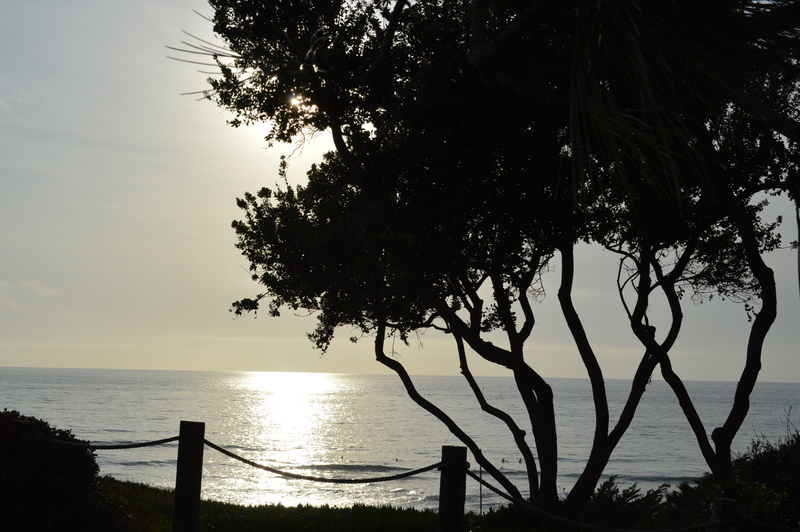 The resort’s mantra “relaxing by day and spirited by night” pretty much encapsulated our L’Auberge Del Mar experience.